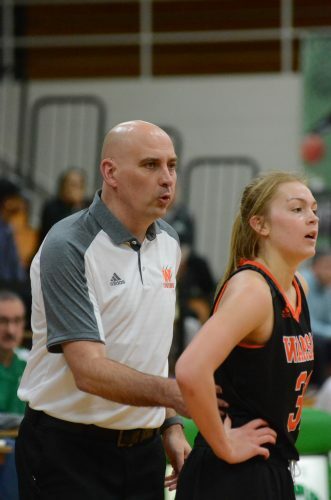 Warsaw girls basketball coach Lenny Krebs has been a busy man since the season ended. Warsaw will host a Spring Bash Tournament Saturday for grades 4-8. WARSAW – Lenny Krebs is one committed coach. The leader of the Warsaw girls basketball program is not one to sit around and let boredom set in. Not when he has a burning passion to move his program forward and impact the lives of countless young ladies in the Lake City. Krebs, who recently completed his first season in charge of the Lady Tigers, is going full speed in the offseason. The former Fairfield High School and Grace College player, who spent 14 seasons as the girls basketball coach at Goshen prior to coming to Warsaw, is working full speed in the offseason. The Warsaw Girls Basketball Development Program, which began practicing in February, will play host to a Spring Bash on Saturday. The event, which is for school teams in grades 4-8, will involve 49 teams. A total of 82 games are scheduled to be played at WCHS (on four courts), in the Career Center Gym at WCHS and at Edgewood Middle School, Lakeview Middle School and Washington Elementary School. Games are slated to begin at 9 a.m. and run until 8 p.m. and Warsaw will have multiple teams in the event, along with squads from other outstanding programs such as Penn, Northridge, Plymouth, NorthWood, Carmel and Homestead. Fans are welcome to come out and see the future of the Warsaw girls basketball program in action all day long on Saturday. Krebs says hosting a tourney of this magnitude is very important to his program. Krebs says that the WGBDP, which has a Board of Directors, is vital to the future of Lady Tiger Basketball. “The WGBDP is designed to make sure we develop the fundamentals and skills of the young ladies in our program, while at the same time striving to teach them the life skills necessary to be successful off the court,” commented Krebs. “I feel it is extremely important that our high school staff (and our players) get to know and build relationships with these young ladies. The coaches in this program are running the high school offenses and defenses and they are also using the high school program’s terminology. Our high school staff is directly involved with all aspects of the program. Krebs was a regular at both elementary and middle school games during the season. He has hit the ground running at full speed in his effort to impact so many young ladies in so many ways that go far beyond the basketball court. That’s the phrase that graces the front of the T-shirts for the Spring Bash Tournament this weekend. It’s something that someone with the commitment of Krebs is doing every day.